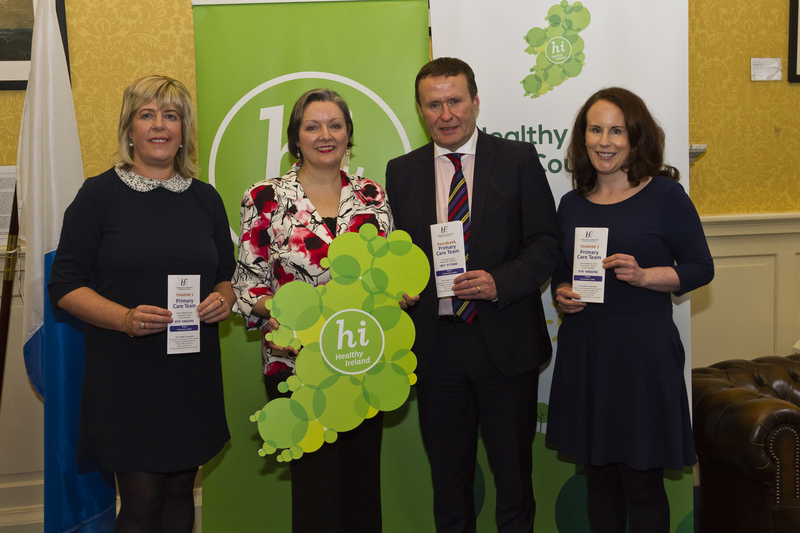 Susan Murphy (Primary Care Team Lead, Waterford), Marcella Corcoran Kennedy (Minister for Health Promotion), TJ Dunford (General Manager, Waterford/Wexford Community Services) and Kate Moloney (Healthy Waterford Coordinator). A Patient Information Leaflet for use by Primary Care Teams in the Waterford area has been launched. Minister of State for Health Promotion Marcella Corcoran Kennedy joined with the HSE’s Waterford Community Services management, those involved in Healthy Waterford, local GPs and other health professionals working with them in the 13 Primary Care Teams centred on various parts of the city and county to launch the information leaflets that detail the range of services on offer through primary care and how to access them. “This is what Healthy Ireland is all about – empowering and supporting communities and individuals to make healthier lifestyle choices. Encouraging health literacy and providing accessible information are significant components in helping people to look after their health,” said Minister Corcoran Kennedy. Each double sided A4 leaflet contains contact details for Waterford’s Primary Care Team, out of hours GP service and other useful contacts. Each Primary Care Team (PCT) includes GPs, nurses, a physiotherapist, a speech and language therapist and an occupational therapist. PCTs also provide social work, home support and administrative staff. PCTs can also link to a network of personnel who support the team, including psychologists/counsellors, audiologists, podiatrists, area medical officers, dentists, dieticians and ophthalmologists. The team’s aims are to provide accessible, integrated, quality primary care services that meet the needs of the local population. Any member of the Primary Care Team can refer a patient to the other services on offer. Susan Murphy, the HSE’s Primary Care Lead in Waterford, and Kate Moloney, Healthy Waterford Co-Ordinator, have been working together for the past year to collect the data and present it in easy read format. Kate Moloney of Healthy Waterford – which is supported by the HSE and works with a range of stakeholders including City and County Council, the Area Partnership, the Childcare Committee and the Sports Partnership, Waterford Institute of Technology and Public Participation Network – was also delighted to welcome Minister Corcoran Kennedy’s launch of the leaflets. “As a community initiative, Healthy Waterford aims to improve health and to reduce health inequality by promoting healthy living and providing supportive environments. 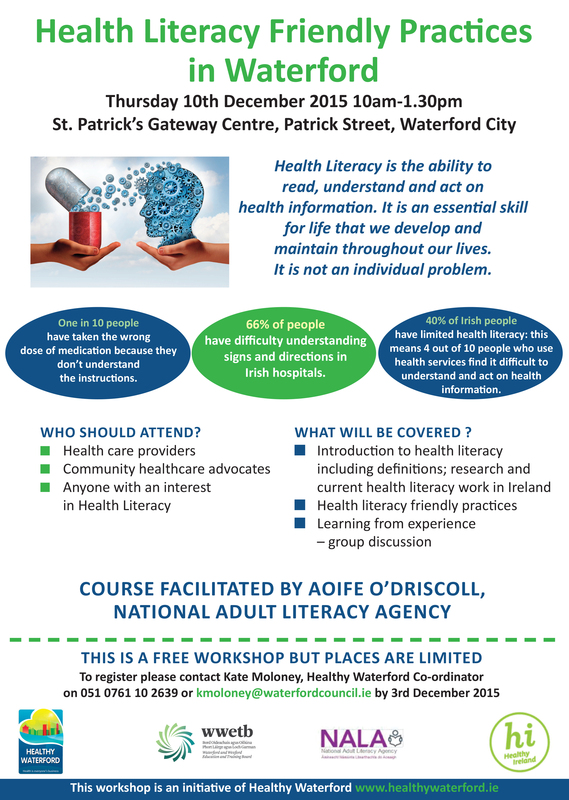 The Primary Care Patient information leaflet was developed as part of Healthy Waterford’s work around health literacy. It was produced as a joint initiative between HSE Primary Care in Waterford and ourselves and has been ‘Plain English’ edited by the National Adult Literacy Agency,” she said.